Weddings by Marius was involved in creating the perfect celebration for Nanindi and Gabriel on the 27th of August 2011. Both the bride and Gabriel had the same idea and that was to creat an “an unforgettable Winter Wonderland!”. Thanks to Marius and his instrinct and perception they had the perfect backgroud of the Stellenbosch mountains as well as Molenvliet‟s rolling vineyards and remarkable wines. After the ceremony the guests arrived for canapés and pre-drinks and were delighted to find the courtyard had been transformed into a cigar lounge á la Cuba. The warm leather shades of brown and red and dotted with Persian carpets, tea boxes and Moroccan lanterns set the mood. While long white tables – laden with champagne in silver coolers, elegant glassware and succulent oysters served courtesy of The Oyster King – stretched either side of the entrance while the tuneful sounds of Zamar floated gently on the air. The setting was, in a word, a complete masterpiece in white and blue. 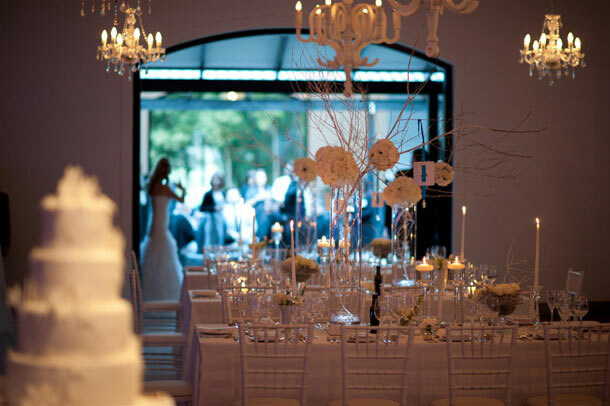 White table linen, white chairs, white flowers and white floral arrangements stood in sharp relief against the ice blue lighting effects: walls uplit in dark blue, gentler wash lighting for the roof, even the band similarly backlit, and the dance floor – swirled in heavy fog – perfectly captured the soft reflection of the fairy lighting from the canopy above. Borrowing from a Scottish tradition, Gabriel and I shared a “marriage of the wines‟ ritual where, in a powerful moment of recommitment, we each added our blend of wine to an age-old wine vat from where it was decanted into stylish carafes for all our guests to share in during the evening.